I’m going to go out on a limb here and say that most people like organization. I say “most” because there may be a few people who prefer the chaos that comes with not being able to find what they need, when they need it, or they enjoy constantly navigating through the landmines of clutter. Why is it that even though everyone enjoys the idea of an organized home, so many still feel like they live in chaos? Here’s the truth. Organizing does take time, but you don’t have to wait until you have a whole day to start. The little things add up and are hugely beneficial. 10-15 minutes a day is enough time to tackle a drawer or a shelf and make some progress. Just pick an area and get started. I love digging in to an organization project, but I will admit there are times I look at the mess and I get this sinking feeling and overwhelm starts to creep in. For me it’s usually the basement storage area. “What if I can’t do it? What if I am unable to put it back and get it organized?” or “Is it going to stay like this forever?”. Thankfully I’ve never had an organization project not come to completion, but I have to keep going to see it through. Even though I am a huge organization nerd, there are times I can feel like it’s too much to handle and I have to dig deep to keep going. 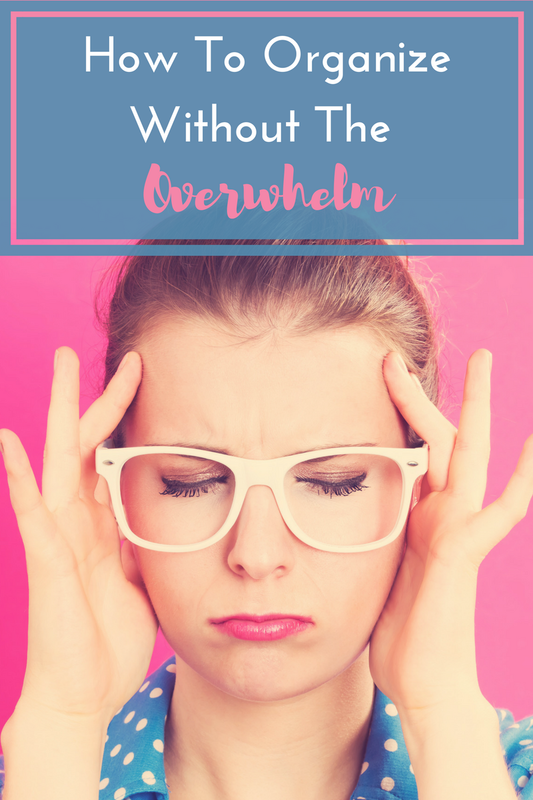 However, there are a few things I have discovered over the years to lessen or avoid the feelings of overwhelm. Get out of the perfection mentality. You don’t have to have the perfect containers or perfect shelving unit to be organized. Use what you have for now and eventually you can work towards getting what it is you would like. This was a huge hang-up for me for years. I was so frustrated with what I didn’t have, that I had a hard time moving forward. I learned to just pull up my bootstraps, dig in and move forward, but most importantly I've learned to be thankful for what I did have and working with what was available to me. Don’t start a massive organizing project (like the whole house) when you are in a busy season of life (new baby, visitors, during big holidays or sickness). Been there. Done that. Got the t-shirt. It was OVERWHELMING to add trying to organize my whole house at the same time as having a newborn…and toddlers. Or just before guests come to town. Or before a big holiday that already has lots going on. Just stop. Don’t do it. If you are going to organize, do it well in advance before these events. Once your house is in order, keep on top of cleaning and organizing things daily, weekly and monthly. This helps maintain the order and makes it quicker and easier the next time. It takes me way less time these days to put our place in order since I do regular decluttering and organizing throughout the year. 2-3 hours is about all I can do in a day for one project. At that point, it’s time to step back, take a break, have a snack and get some fresh perspective, or go onto something else that’s unrelated. Even if you only have a few minutes a day, the little wins can give you the encouragement to keep going and to tackle the larger tasks. Start with a drawer or cupboard. For example, don’t feel like you have to do the whole kitchen in one day. Read about my small organization projects here and here. Little projects with big impact. If the idea of organizing your whole house is too overwhelming, start with decluttering small areas first. Once the areas are decluttered, it’ll be that much easier to organize the area. Decluttering is the first step to organizing anyhow, so get a head start. See the 15 minutes a day declutter challenge here. It’s ok to call for back up. Whether it’s a friend or family member, or even some advice from a FB page you’re following. I could talk about organizing for days, I really enjoy doing it and I enjoy the satisfaction that comes from an organized space. It helps me think more clearly and run my home more efficiently. It really is one of the best weapons against disorder in the home. You can have an organized home without the overwhelm and with only a few minutes a day. Have fun! Put on some music and get to work! I’d love to see your before and after pictures!